U2 auction – Do you take cash for that? Former U2 stylist Lola Cashman is putting some U2 items up for auction on the music collectibles and memorabilia site gottahaverockandroll.com. U2 sued Cashman in 2006, claiming she acquired some items – including the infamous Stetson hat – without the band’s permission. The auction includes Bono’s rosary beads, a bible signed by Larry Mullen (‘with real love’) as well as the drummer’s signed, worn sneakers. (Eeew.) Most fun though is the inclusion of the stylist’s ‘measurement’ book, which is sure to raise a smile as well as a few bucks ($800). You can flip through some of the pages on the auction site. Now what we’d like to know is… who would pay 1,200 dollars for a signed, crumpled copy of Rolling Stone magazine? The African Well Fund is launching its second Build a Well for Bono’s Birthday auction, this time a “The Joshua Tree” LP signed by Bono, Adam Clayton and The Edge is up for bid. The auction will take place on AWF’s eBay page from Sunday, March 22, World Water Day, through Wednesday, March 25. Bidding will start at $70 to coincide with the “70 Days to Change the World” Bono’s Birthday Well theme. The LP was donated by a U2 fan who got Edge’s signature in New York on March 6 when U2 played Fordham University for “Good Morning America,” and Bono’s and Adam’s signatures when U2 was in Los Angeles on March 9 for the first night of the “U2 3 Nights Live” radio broadcasts. “At first, I had no intentions of donating my autographs,” the donor said. “I am a huge U2 fan, so to have a Grammy-award-winning album signed by three members of the band was the ultimate treasure. But I kept feeling God tug at my heart and he led me to the scripture in Matthew 6:19 about not storing treasures on earth. I believe that when God blesses us beyond our needs, those additional blessings are for the purpose of meeting the needs of others. “A friend sent me the link to the African Well Fund auction of U2’s ‘Under a Blood Red Sky’ CD and that’s when God prompted me to donate my ‘Joshua Tree’ album to help build a well for Bono’s birthday,” the donor continued. The closing bid for the “Under a Blood Red Sky” deluxe CD/DVD reissue signed by Bono, Clayton and The Edge was $449. AWF volunteer Ayesha Marcel got the CD/DVD autographed by the three U2 members. Proceeds from both auctions will benefit Build a Well for Bono’s Birthday projects in Liberia. Learn more about the fundraiser. – As a special bonus, the top 10 highest winning ticket bids for each show will also receive a pre-show backstage tour of this highly anticipated, revolutionary product design. It’s all in the name of charity and, as Bono said: “Rich people have feelings too”. 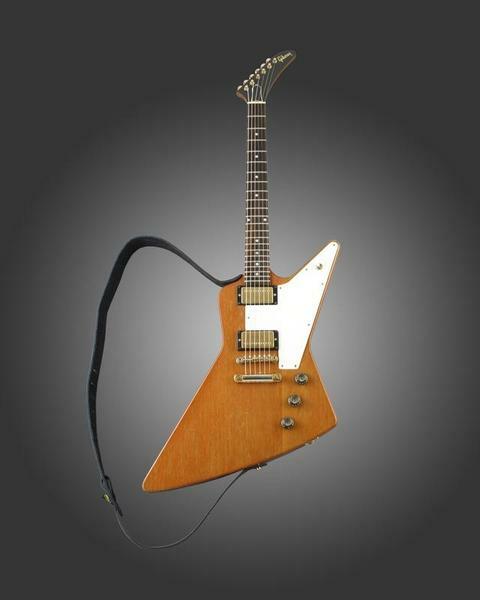 Would you like to own The Edge’s Gibson Explorer? Well, you can if you have deep pockets. The Edge and U2 have donated some extraordinary stuff to the Music Rising auction and you can have a look at the items now on Auction Network. Bono and his pal, the English artist Damien Hirst, lead the The (Red) Auction which raised more than $42 million for programs battling HIV and AIDS. Dutch radio station 3FM and the Red Cross are raising money for children in Congo with various fundraising activities on and off air. 3FM photographer Hans Peter van Velthoven has donated a framed picture of The Edge and Bono, for auction on E-bay. The photo was taken at U2’s Amsterdam concert on July 13. To bid, go to Ebay.nl. It’s for a good cause! Want to own a piece of U2 history? Well, you can. A seller called ‘bruegel2004’ has put up this intriguing item for auction on eBay. Your chance to own U2’s first ever stage backdrop, measuring 260cm X 260cm hand painted ‘BOY’ on canvas. This backdrop has featured in all the band’s early appearences ie. Old Grey Whistle Test and Live At Red Rocks. There are a couple of small holes due to the canvas folding during storage but generally in very good condition and has been well cared for. Your chance to purchase a genuine piece of rock memorabilia. You’re going to have to dig deep for this one. The starting bid is GBP 1,500.00.